Three voice treble LMM - two switches. Swing tuning. Low notes on the row, accidentals on extra two buttons. Four bass switches. Cherry wood. Heavy duty rucksack carrying case. Two voice treble with TAM reeds. The Clovis sits nicely in the Castagnari range between the single voice Lilly and the three voice Tommy. 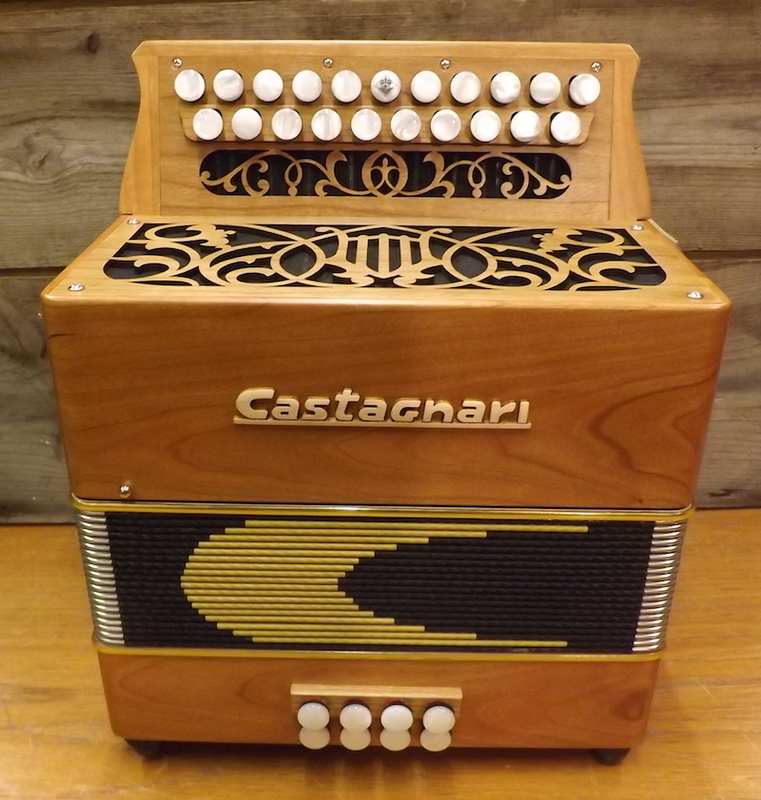 A very punchy little melodeon with the classic Castagnari sound. Swing or Light Tremolo tuning. Scale starts on 4th button (Anahata layout). Cherry and walnut wood in stock. Case (or high quality rucksack) and two straps. Video courtesy of Phil Edwards. Two voice treble with TAM reeds. The Clovis sits nicely in the Castagnari range between the single voice Lilly and the three voice Tommy. 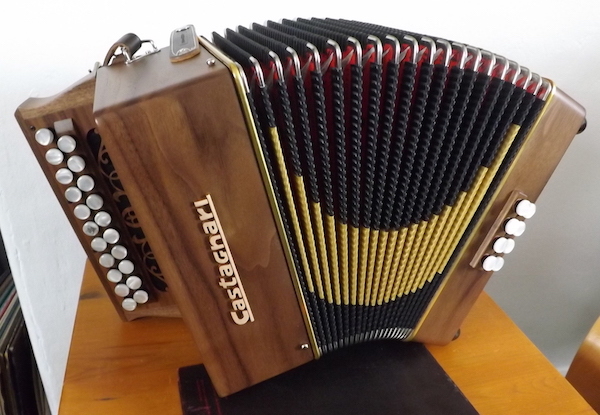 A very punchy little melodeon with the classic Castagnari sound. Swing or Light Tremolo tuning. Scale starts on 4th button (Anahata layout). Cherry and walnut wood in stock. Case (or high quality rucksack) and two straps.. Video courtesy of Phil Williams. Walnut wood. Swing tuned. Smooth and silky sound. Three voice MMM. TAM reeds. Cherry wood finish. Selling on behalf of customer. Bought new in 2005 and hardly played since, therefore practically new condition. G/C two voice treble, swing tuning. Left hand stop to remove thirds. Saltarelle hard case, two Castagnari shoulder straps. Key of D. TAM reeds. LMMH. Standard tuning. A few light scratches on the body. Tuned and serviced. Original Saltarelle carrying case. Single voice treble. TAM reeds. Perfect condition, hardly played. G/C Lillys are much sweeter sounding than the squeaky D/G models. Cherry wood. Case and straps. Early model with silver ends and longer bellows. A classic in very good condition. 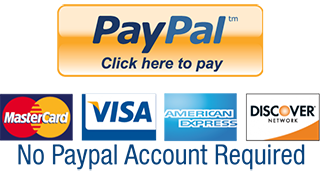 Key of G.
Bank Transfer to Barclays Bank (e-mail for details) or cheque payable to "WESSON ACCORDION Co." Credit/Debit cards now accepted via PayPal. Cash welcome. If you have an instrument for sale I can take it into stock and sell on commission at 20%. A visit to my workshop in Welshpool, Mid-Wales is always possible by prior arrangement (no fixed opening times). I can offer advice, information and small repairs. I am also available for concerts and workshops.